A Beautiful Alternative to DownspoutsSolid Copper Rain Chains install quickly and easily, adding personalityand refined style to any home. Rain gently cascades through and around each chain creating a fountain like effect that is sure to excite the senses. 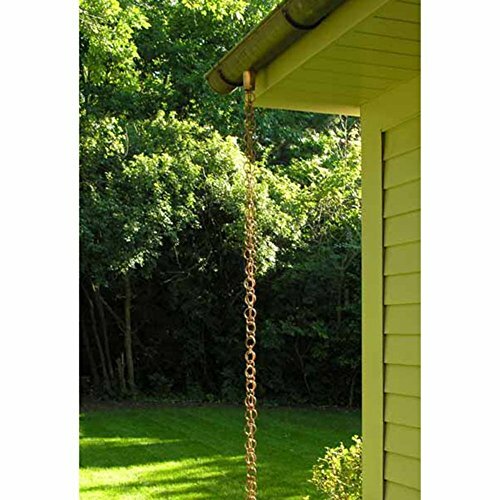 Decorative, yet fully functional, Rain Chains are an elegant and sophisticated “upgrade” from traditional downspouts and represent the latest trend in outdoor home accessories.Our handcrafted pure, thick copper Double Loop Rain Chain is simply breathtaking. Theopen, airy design offers clean lines and is the perfect accent for homes of every shape and style.